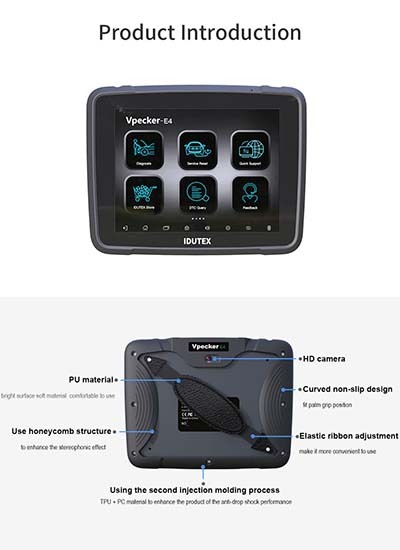 WIFI Idutex Vpecker E4 is an 8 inch Automotive OBDII Diagnostic, Coding and Programming Tool. Vpecker-E4 Auto Coding Programming Scanner support more than 78 cars of US domestic brands, European, Asian, Australian and Chinese vehicles. Vpecker E4, android based multifunctional diagnostic tool with 8 inch tablet developed by IDUTEX, covering over 78 manufactures from Asia, America, Europe, Australia, featuring powerful diagnosing functions with overall special functions(resetting&coding&programming), data replay, data analysis, It meets the customer's requirement and would be the best choice for workshops and mechanics.